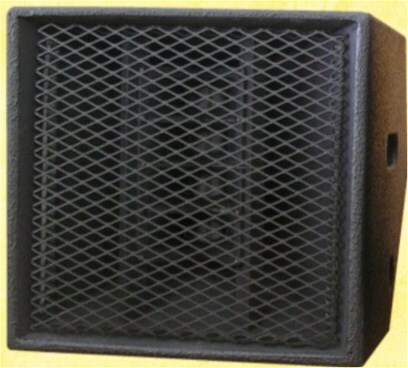 Wedge monitors suffer more from dispersion issues than any other speaker, as the distance to the listener is usually on the order of only six feet. Commercial monitors with ten or twelve inch woofers and narrow dispersion high frequency horns are big, heavy and expensive, but move even a foot to one side or another of the 'sweet spot' and you can't hear them. Wedgehorns are different. Wedgehorns are optimized for maximum output in the midrange to cut though high stage levels, while their multi tweeter arrays deliver high frequency dispersion unequaled by any commercial wedge. I have now built 4 Wedgehorn 8 for a rock band. Loud, clean, small. They punch right through stage clutter and give strong performance for vocals. Every band that's used them at multi band shows (from rappers to metal screamers) has commented on how well they could hear the monitors. 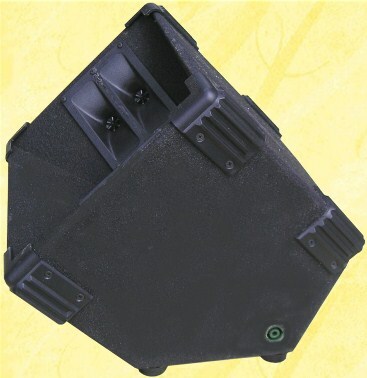 Dual 22.5/45 degree tilt-back angles allow you to place them on the floor with a shallow or a steep angle, for close or distant listening. The W6 is small enough to put atop other gear for very close placement, like a ‘hotspot’ style monitor, but unlike those you can actually hear a W6. And if 18 pounds is still more than you want to carry the W6 can be built from ¼ inch plywood, for a net weight of only 12 pounds. The Wedgehorn 6 and Wedgehorn 8 are two separate plans. You must specify when ordering which plan you want. Plans are $14.95, delivered within 24 hours as email attachment in MS Word format. 17 pages, 12 photos, 24 diagrams. PDF available on request.